The new online Keno game at WinADay Casino is nothing like their first one. Unlike the graphically stunning steam-punk-theme of WinADay’s first Keno game, the new Keno 101 is a very traditional version of the classic casino game – just like the Keno cards found everywhere from coffee shops to grocery stores in Las Vegas. One of WinADay’s most avid keno players, Georgia T., has written a review of the new game and she offers a tip to other players in her most recent “Keno Tips” column at WinADay Casino’s Facebook page. Keno players choose up to fifteen numbers that they think will be among the 80 numbers drawn. Payouts are based on how many match the numbers selected on the Keno ticket. 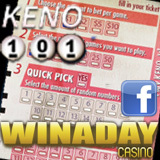 WinADay Casino now has two Keno games, 20 slot machine games, six video poker games and two versions of Roulette. Most slots games are connected to one progressive jackpot. The jackpot is currently nearly $150,000 and due for a hit, many say, since the average jackpot since 2008 is $134,184. The last jackpot winner was in February when Vera M. won a record-breaking $255,462 playing one of the casino’s slot machines, Chinatown. WinADayCasino.com’s 30 unique games aren’t available at any other online casino. A new pet-themed slots game is expected to launch early summer.